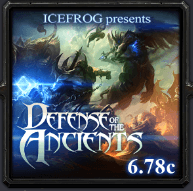 DotA v6.78c AI map has been released by Defense of the Ancients development team. The DotA AI map consists of computer controlled players called Bots. With the help of this map, you can play DotA offline without any need of working internet/network connection. DotA 6.78c AI v1.4e contains improved AI item builds, skills and optimizations. If you are a beginner and want to learn the basics of DotA or Dota 2, AI maps are perfect for this purpose. Download the map file with [.w3x] extensions. Open your Warcraft III Frozen Throne directory, go top maps folder and drop the map file there. Just make sure you have v1.24e or v1.26a patch installed before playing. 1. All of 6.78c content has been ported. 2. All AI heroes have their skills updated, they should work properly (more or less). 4. Name roster for -cn mode has been updated. Now it contains the names of TI3 contestants, instead of TI2. 8. Now when AI is lvl25 and XP/Gold bonus mode is active, it will get extra boost to gold ( since bonus xp for lvl25 hero won’t matter anymore ). 9. Fixed some minor bugs that were reported. Most of them shouldn’t happen anymore. This is the initial release, so expect minor bugs or glitches. DotA 6.79e AI will released after this map is deemed stable. Post a comment if you encounter error(s) or anything unusual.